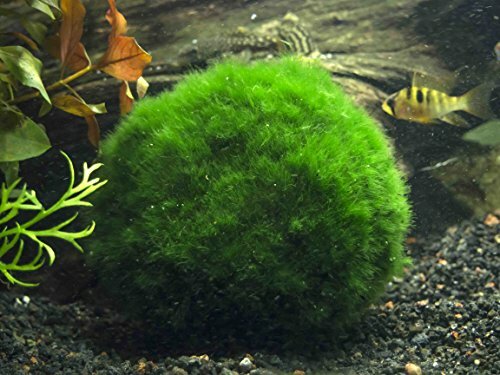 This listing is for 3 Giant Marimo Moss Balls (+1 free). These are one of the most popular plants in the aquarium hobby, and they are widely kept as ornamental plants in jars in Japan. The moss balls generate oxygen and remove nitrates, improving water quality. This is definitely something different for your aquarium that you don't see often! If you wish, you can cut the moss balls into smaller pieces and the individual pieces will grow into separate moss balls. Marimo balls are great for outdoor ponds. However, they tend to develop brown or pale spots when placed in direct sunlight, so a shady spot is the best place for them. They are also wonderful in aquariums and terrariums. Marimo have very minimal care requirements; all they really need is a little light, as well as a water change every two weeks or so. Marimo balls are also thought to represent everlasting love; thus, they are often used as wedding table ornaments or even gifted at weddings. They are appropriate as a gift to the bride and groom, and smaller marimo balls make wonderful take-home gifts for the guests that will serve as mementos of the newly-weds' special day. Aquatic Arts is the best rated brand of Marimo on Amazon! Great for outdoor ponds, terrariums, or aquariums! Unlike other brands, Aquatic Arts Marimo is shipped in a rigid container rather than a plastic bag to ensure your new Marimo do not arrived smashed. Box of 10 Borinda Macclureana, Live Tibetan Clumping Bamboo, Great Hedge or Specimen.